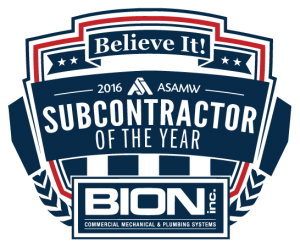 Two BION Employees Selected for National Apprentice Competition – BION, inc. This year, BION, Inc. is proud to send two employees, Tony and Tyler, to a competition for the nation’s top 30 apprentices in their industry, during the Plumbing Heating Cooling Contractors (PHCC) Association CONNECT Conference, October 10-12 in Albuquerque, NM. 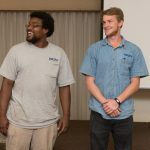 Both men are enrolled in a four-year DOL-certified Apprenticeship Program, under BION’s sponsorship. Tyler will compete in the plumbing competition; Tony in HVAC (heating, ventilation, air conditioning). Both contests include a written test and a hands-on demonstration of skill. “The contests support the (PHCC Educational) Foundation’s mission by helping to generate awareness for local apprenticeship programs, boosting interest in the fields of plumbing and HVAC and attracting new recruits,” states the PHCC National Association website. Tony joined our team in 2015, with no previous experience, and began his apprenticeship shortly thereafter. He has completed one plumbing class and three HVAC classes, and said that, while it can be a challenge to balance responsibilities at home, work and school, it is worth the effort. After graduating the program, Tony hopes to sit for his journeyman’s exam and eventually earn a HVAC master’s certificate. 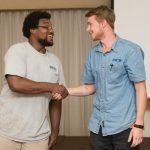 Tyler, also in his third-year with BION, placed in a statewide Plumbing Apprenticeship Contest, which required participants to rough-in a prebuilt half bathroom in under seven hours. He excelled despite the challenge using PVC, a material he works with less frequently than cast iron. To prepare for CONNECT, Tyler turns to his BION mentors: Dave, who taught him about plumbing codes and application, and John, who inspires him to challenge himself and work hard. Tyler said he also values the support of the whole BION team. “Everybody is willing to answer questions and teach new things,” said Tyler. We look forward to cheering on both Tony and Tyler during their competitions, and as they continue to flourish during their BION careers. For those attending CONNECT, the contest will take place on the tradeshow floor where attendees can watch—and root for Team BION! 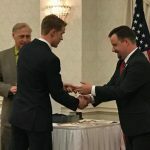 BION employee Tyler accepting award in a state plumbing apprentice championship.